Helpful crew will find you new friends to share a shore excursion or a table for dinner. Keen to try a cruise but worried about sailing solo? Don’t be. A cruise, and, more to the point, a cruise with Saga, is a relaxing, stress-free and sociable way to travel on your own. For a start, you won’t be the only single in a sea of couples. On a typical cruise with Saga, a good proportion of passengers travel solo and there are all manner of activities to make sure you have the opportunity to make new friends. “The biggest concern single travellers have is meeting other people,” says Kayleigh Lane, currently cruise director on Saga Pearl II. Getting to the ship needn’t be a worry. One of the joys about cruising with Saga is that you don’t even have to make your own way to the airport or port. A chauffeur will pick you up from home (within a 250-mile radius) and will be waiting for you again for the return journey. If you prefer not to fly, there’s a wide choice of cruises departing from British ports; in fact, Saga’s new Spirit of Discovery, when she launches in 2019, will sail only from UK ports for her maiden season. Saga Sapphire carries 720 and the smaller, yacht-like Saga Pearl II takes 449. Spirit of Discovery will carry under 1,000, but will feel light and spacious; every cabin will have a balcony, including the 100 or so single cabins. There’s nothing intimidating about a Saga cruise, either. No gimmicks, no garish attractions; just elegant, comfortable ships where timeless traditions are celebrated, like afternoon tea, ballroom dancing and on some nights, dressing for dinner. Because Saga only carries passengers over 50, you’ll find plenty of like-minded company on board. Some cruises have a theme, from music to murder-mystery to hunting for the Northern Lights, so check the Saga website for special interest voyages. Because Saga’s ships are small, they can get to the heart of some of the world’s most beautiful ports. In Bordeaux, Saga Pearl II sails right up the Garonne river to dock in the city centre, while Saga Sapphire often berths on the English Embankment in St Petersburg, at the heart of the city. Price is often a concern for single travellers and you do need to book early to bag a single cabin, although for the level of luxury it offers, a Saga cruise is excellent value; a single traveller would pay £3,654 for 14 nights in the Canaries in October 2018, for example – around £261 a night, full board. Because Saga’s ships have a far greater proportion of single accommodation than others, there are more of these single fares available. There are other ways to save, too. Pick a ‘guarantee’ cabin – which means you’re guaranteed a cabin grade but the actual room will be allocated nearer the time – and you could make a saving on the cruise fare. Even novice cruisers will quickly relax into the rhythm of shipboard life. Saga’s friendly crew do everything they can to make solo travellers feel at home quickly. “On the first sea day, we hold a ‘singles mingle’ in one of the lounges and I go around all the tables introducing myself and my team while the guests enjoy a glass of Buck’s Fizz,” says Kayleigh. “I’ve honed a talent over the years for remembering names, so I introduce them all to each other and talk about all the things they can get involved in during the cruise. I’d suggest that they make the most of everything there is to do. Even if it’s something you might not want to take part in, come along and watch and have a cup of tea. “If the itinerary permits, we have a singles lunch, too, also on a sea day. We put everybody on allocated tables and after the starter, two people move from each table, then two more after the main and so on. It’s a great ice breaker.” Even during on shore excursions, singles are looked after. “On port days, we have an independent travellers’ meeting time, usually 15 minutes before the tours depart, so single travellers can see if there’s anybody they’d like to join for the tour and sit with on the bus,” says Kayleigh. Dinners on Saga ships are open seating, which means you can arrive when you want and sit where you want. But this doesn’t mean a table for one, unless that’s what you prefer. In the main dining room there are plenty of tables seating four, six or eight; just ask the maître d’ to seat you with nice people – and remember, you don’t have to repeat the experience if you don’t take to your companions. Later at night, the ship comes alive with music and entertainment. Take in a show, or sit in one of the lounges and listen to some jazz. Best of all, if you love dancing, remember that on a Saga cruise there are no wallflowers. Gentleman dance hosts are at the ready to spin single ladies around the floor – and even if you have two left feet, it’s fun and exhilarating to have a ready-made dance partner. 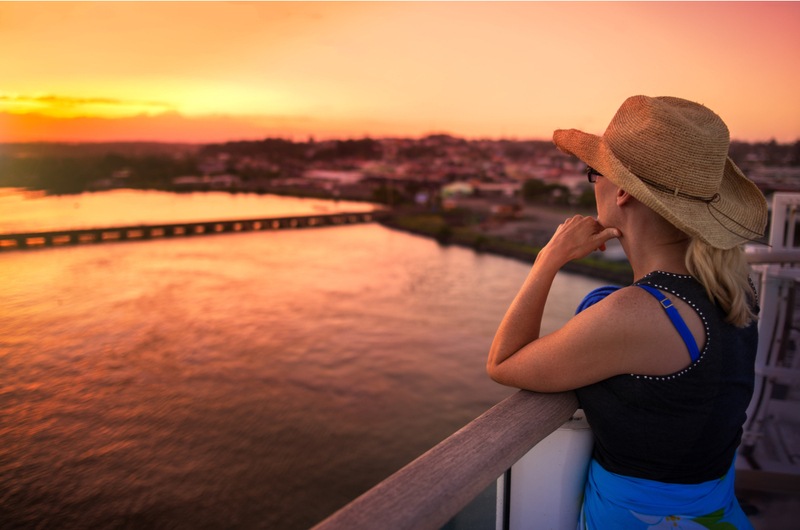 The idea that people make friends for life on a Saga cruise is no myth; according to Kayleigh, people often find themselves a cruise buddy. And finding love at sea? Don’t write it off, Kayleigh says. “We do have one gentleman on board now who lost his wife last year, which was very sad. He came on the Christmas cruise and I could see that it was difficult for him. But he struck up a friendship with a lady and they have booked the next Christmas cruise together. He mentioned to one of my staff that he was going to propose.